The Catcher Was a Spy is a 2018 American biographical spy film directed by Ben Lewin and written by Robert Rodat, based on the book of the same name by Nicholas Dawidoff. It stars Paul Rudd as Moe Berg, a former baseball player who joined the war effort during World War II and partook in espionage for the U.S. Government. Mark Strong, Sienna Miller, Jeff Daniels, Tom Wilkinson, Giancarlo Giannini, Hiroyuki Sanada, Guy Pearce, and Paul Giamatti also star. The film premiered at the 2018 Sundance Film Festival, and was released on June 22, 2018, by IFC Films. Moe Berg, a 15-year baseball veteran, joins the war effort as a spy to beat Nazi Germany in the race to build the first atomic bomb. The project was announced on April 26, 2016, with Ben Lewin hired to direct, Robert Rodat tasked with adapting the biography, and Paul Rudd cast as Moe Berg; PalmStar Media would produce. In February 2017, Guy Pearce, Jeff Daniels, Paul Giamatti, Sienna Miller, and Giancarlo Giannini were added to the cast. Filming began on February 13, with filming locations being Prague and Boston. Hiroyuki Sanada was cast in March, with Tom Wilkinson, Connie Nielsen, and Shea Whigham joining in April. Principal photography lasted for 30 days. The film was set to have its world premiere at the Toronto International Film Festival in September 2017, but the film was pulled out after it was realized that post-production would not be complete in time. It premiered at the 2018 Sundance Film Festival. IFC Films acquired the film and set a release date of June 22, 2018. The Catcher Was a Spy made $114,771 from 49 theaters in its opening weekend, for an average of $2,459 per venue. On review aggregator Rotten Tomatoes, the film holds an approval rating of 33% based on 70 reviews, with an average rating of 5.2/10. The website's critical consensus reads, "The Catcher Was a Spy loses sight of the most interesting elements of its fact-based story, dropping the ball and leaving likable lead Paul Rudd stranded." On Metacritic, the film has a weighted average score of 49 out of 100, based on 27 critics, indicating "mixed or average reviews." ^ "The Catcher Was a Spy (2018)". Box Office Mojo. IMDb. Retrieved August 26, 2018. ^ Fleming, Mike Jr. (April 28, 2016). "Paul Rudd Set To Star As Moe Berg In Fact-Based WWII Tale 'The Catcher Was A Spy'". Deadline Hollywood. Penske Business Media. Retrieved November 29, 2017. ^ Fleming, Mike Jr. (February 9, 2017). "Paul Giamatti & Jeff Daniels Join Paul Rudd In 'Catcher Was A Spy'". Deadline Hollywood. Penske Business Media. Retrieved November 29, 2017. ^ Fleming, Mike Jr. (February 23, 2017). "Sienna Miller, Giancarlo Giannini Join 'The Catcher Was A Spy'". Deadline Hollywood. Penske Business Media. Retrieved November 29, 2017. ^ N'Duka, Amanda (March 1, 2017). "Hiroyuki Sanada Cast In 'The Catcher Was A Spy'; Talitha Bateman Boards 'Simon vs. The Homo Sapiens Agenda'". Deadline Hollywood. Penske Business Media. Retrieved November 29, 2017. ^ N'Duka, Amanda (April 5, 2017). "Tom Wilkinson, Connie Nielsen & Shea Whigham Board 'Catcher Was A Spy'". Deadline Hollywood. Penske Business Media. Retrieved November 29, 2017. ^ "How DP Andrij Parekh Used Noir Lighting to Modernize 'The Catcher Was a Spy'". June 25, 2018. Retrieved July 31, 2018. ^ Jagernauth, Kevin (August 14, 2017). 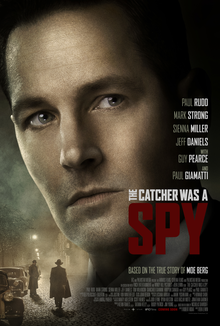 "'The Catcher Was A Spy' Starring Paul Rudd & Guy Pearce Pulled From TIFF". The Playlist. Retrieved November 29, 2017. ^ Debruge, Peter (November 29, 2017). "Sundance Film Festival Unveils Full 2018 Features Lineup". Variety. Penske Business Media. Retrieved November 29, 2017. ^ Lee, Ashley; Lewis, Hilary (May 1, 2018). "Paul Rudd Starrer 'Catcher Was a Spy' Goes to IFC Films". The Hollywood Reporter. Prometheus Global Media. Retrieved June 14, 2018. ^ Brooks, Brian (June 24, 2018). "'The King' Reigns Over Mixed Weekend of Openers; 'Won't You Be My Neighbor?' Expands Robustly: Specialty Box Office". Deadline Hollywood. Penske Business Media. Retrieved June 26, 2018. ^ "The Catcher Was a Spy (2018)". Rotten Tomatoes. Fandango Media. Retrieved October 29, 2018. ^ "The Catcher Was a Spy Reviews". Metacritic. CBS Interactive. Retrieved October 29, 2018.